If you had watched Shrek the animated movie, this Shrek the musical sticks quite closely to the storyline of the movie, with an addition of an interesting backstory of how Shrek and Fiona have ended up the way they are – isolated in their home (the swamp and the castle respectively). One fun fact to note is that the boy Shrek you see in the opening sequence is actually one of a few Singaporean boys recruited in a Shrek the musical casting call earlier this year! Even if you haven’t see the movie, the story of Shrek the musical is easy to follow. 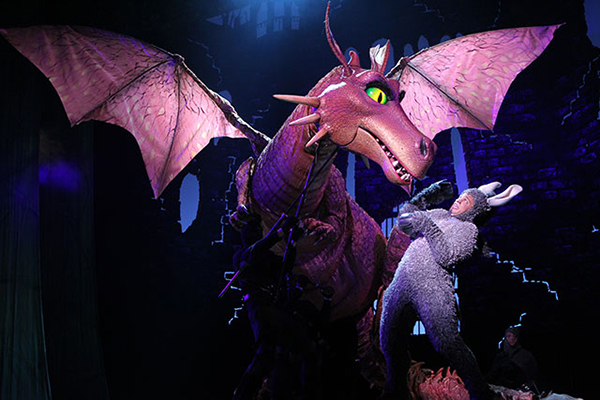 The stage sets are very impressive – from the swamp of Shrek’s home to Fiona’s tower guarded by a dragon – the transition between scenes was smooth and the clever use of lighting and stage props brought realism to the stage sets. 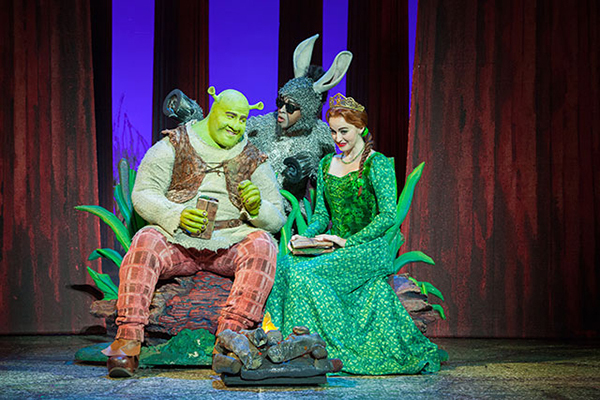 I loved the performances by Donkey and Princess Fiona – very clear singing and articulation. The script was written very well and witty too – with clever jokes inserted in between conversations. The actor who played Donkey carried out the role perfectly in both irritating Shrek and at the same time talking some sense into Shrek! If you had watched the movie, you would have remembered the villain in the show – the undersized Lord Farquaad. The musical had found a way to portray the short Farquaad rather cleverly and you can expect a lot of “height” jokes in this musical – I just leave it to you to see for yourself how Lord Farquaad’s role is played out. The other challenge is bringing the Dragon to life – as you can see from the picture below, they sure did a good job in portraying the dragon (in a dragon-dance style with man clad in all black moving the dragon around! It is all these attention to detail and clever use of stage set and props that brings out the magical kingdom that Shrek resides in, alive and makes this Shrek the musical a very interesting one!